Jan Millehan has published articles relating to health, fitness and disease on various websites. Her publishing history includes health-related articles on blogs and online directories, as well as an essay published in the Bridgewater College journal, "Philomathean." Millehan received a Bachelor of Science in elementary education from Bridgewater College. Essential oils have been used for thousands of years to treat various ailments and skin conditions, and for perfumes. Some are thought to moisturize, assist in tissue rebirth and help reduce eye wrinkles, according to “The Illustrated Encyclopedia of Healing Remedies.” Optometrist Gary Heiting, of the website All About Vision, says some essential oils may help with eye conditions. Essential oils are too potent to use alone and must be mixed with carrier oil such as almond oil or jojoba oil. They have not been medically proven to treat any illness or condition; check with your health care provider before using. The omega-3 fatty acids in flaxseed oil may benefit eye health. Dr. Heiting states that flaxseed oil can help a person suffering from dry eyes when taken daily with other supplements or alone. He states that flaxseed oil seems to reduce “dry eye symptoms, including burning, stinging, redness and intermittent visual disturbance.” In addition, Heiting says that research also points to a decrease in the incidence of cataracts and macular degeneration. Fish oil, while not an essential oil, is also recommended by Dr. Heiting to treat these eye conditions. There is insufficient evidence to support flaxseed oil or fish oil in the treatment of any condition. Mary McConnell, on GoodHouseKeeping.com, says that ancient Egyptian women used the petals of crushed chamomile on their skin. Chamomile oil is an antioxidant, anti-inflammatory and is detoxifying. McConnell says that this essential oil narrows blood vessels—reducing redness--and can help with puffy eyes. Chamomile oil can also be used to soothe dry skin around your eyes. Chamomile oil has not been proven to benefit any disorder, however. Lavender oil and lemon oil can be used to treat sties and conjunctivitis, according to “The Guide to Remedies: Homeopathy, Essential Oils, Crystals and Home Remedies.” This guide recommends mixing lavender and lemon oil with boiled water and washing the eye. Lavender oil is calming and healing for skin around the eyes. Lavender oil and lemon oil have not been clinically proven to treat eye disorders. Rose oil is known to ease dry skin and reduce wrinkles. A suggested blend is drops of rose oil, frankincense oil, and sandalwood oil in jojoba oil. Rose oil is good for sensitive skin and is known to rejuvenate your skin. Rosewood oil is also a remedy for wrinkles. “The Guide to Remedies: Homeopathy, Essential Oils, Crystals, and Home Remedies” recommends gentle rosewood oil to regenerate tissue and reduce wrinkles. 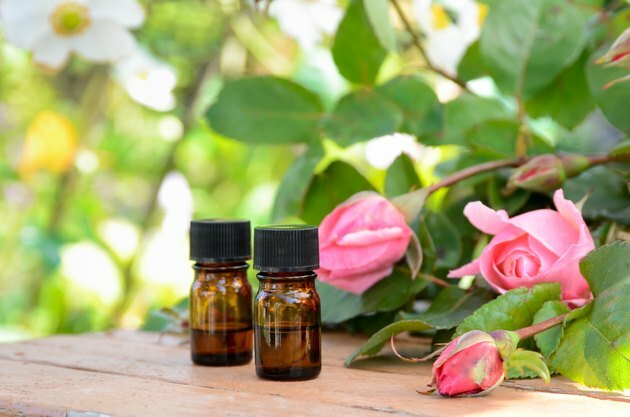 Although, thought to benefit dry skin and wrinkles, there is not enough evidence to support the use of rose oil and rosewood oil as a treatment. Can Any Essential Oils Help to Firm Skin?